1Department of Environmental Sciences, School of Natural Resources and Environment, University of Birjand, Birjand, Iran. 2Department of Chemistry, College of Science, University of Birjand, Birjand, Iran. The presence of Arsenic in drinking water is the greatest threat to health effects especially in water. 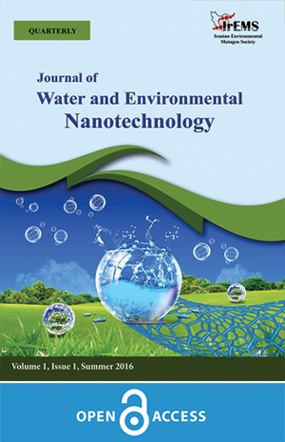 The purpose of this study is application of green palladium nanoparticles for removal of trivalent Arsenic from aqueous solutions and also the impact of some factors such as retention time, pH, concentration of palladium nanoparticles and Arsenic concentrations was studied. The values for Arsenic removal from aqueous solutions were measured by furnace atomic adsorption spectrometry (Conter AA700). In the study, Langmuir and Freundlich isotherm models and pseudo-second order kinetic model were studied. The results of optimization is shown that 0.5 g of nanoparticles can removed %99.8 of Arsenic with initial concentration of 0.5 g/l, in 5 minutes at pH=4. Langmuir model, Freundlich model (R2=0.94) and pseudo-second order kinetic model (R2=0.99) shown high correlation for removing of Arsenic from aqueous solutions. It was found, palladium nanoparticles can be used as an efficient method to remove Arsenic from aqueous solutions in a short time. Heavy metals are accounted to cause universal and serious issues that have very high toxicity for the health of human being as well as the environment. The heavy metals whose specific weight is higher than 5 g/cm3 have been extensively used in the industries which unfortunately can accumulate in the environment and body tissues of living beings[1, 2]. Though heavy metals are classified into two groups of essential and non-essential elements, nickel, iron, copper, zinc, and manganese are namely the essential elements required for growth and development of plants, but Arsenic, cadmium, mercury, chrome, and lead are not essential for the living beings [3, 4]. Arsenic is a metalloid found naturally in water, air, earth’s crust (rocks and soils) and living systems. Probably presence of Arsenic in drinking water, especially in the underground waters, is the biggest threat for the therapeutics which causes issues such as pulmonary issues, skin lesions and bladder cancer [5-7]. Nevertheless, the emergence of this element in waters is due to human and natural activities and is dependent on temperature, pH, oxidation, and soluble compound The natural concentration of this element lower than 1-2 µg/l are natural in waters . Generally, Arsenic is found in non-organic forms as a five valence arsenate oxyanions [As (V) or Arsenate) or three valence Arsenite [As (III) or Arsenite) in natural waters wherein Arsenite has higher impairments and toxicity (25-60 times more) for human beings and environment . Some countries have a lowest standard Arsenic level (10 g/l or 10 ppb), although most of them viz. China, Bangladesh, Egypt, India, Indonesia, Philippines, and others have a highest standard Arsenic level (50 g/l or 50 ppb) in their regulatory systems. Therefore, some of the general methods that are used for Arsenic adsorption include chemical oxidation, iron sheathed sand and gravel, adsorption, ion exchange resin, activated alumina, membrane processes, nanofiltration and etc. Although some of these advanced methods are frequently expensive [13, 14], but adsorption is a cost-effective simple and efficient method for the adsorption of heavy metals ions from the waste [12, 15]. Till date for the Adsorption of Arsenic from aqueous solutions the nanoparticles such as zero valence iron nanoparticles[16, 17], dioxide titanium nanocrystals , titanium oxide nanoparticles , Europium , copper oxide , gold , and others have been used at the global level and in even in Iran some studies have been carried out in this field [23-25]. Palladium nanoparticles are used as catalysts to reduce vehicle pollution and have many potential applications for organic and inorganic regeneration reactions. Besides that, palladium nanoparticles have high reactivity and acceptable adsorption capability due to the high specific surface area. As well, these nanoparticles are used to correct and adsorption environmental pollution[26, 27]. The main aim of present study was Adsorption of Arsenic from aqueous solutions via palladium bio-nanoparticles and determination of optimal conditions of adsorption. In this study, the effect of retention time, pH, different concentrations of palladium nanoparticles and Arsenic has been investigated. The palladium bio-nanoparticles were prepared using Chlorella Vulgaris alga extract procured from the Natural Resources and Environment Division of Birjand University. Pd NPs which is used were spherical with good monodispersity and crystalline in nature. The average particle size was 15nm. In this study, for the preparation of sample water containing Arsenic (III), NaAsO2 was used. For the preparation of Arsenic stock solution (1000 ppm) using the atomic mass of the considered salt (129.9 g/mol), 1.73 g of Sodium Arsenite salt was dissolved in 1-liter deionized water. The entire experiment was carried out at a temperature of 25±1 ˚C in 150 mm Erlenmeyer and was shaken at 200 rpm . In these experiments, the influence of factors such as retention time (2, 5, 10, 15, 20, 30 minutes), pH (3, 4, 5, 6, 7, 8), concentration of Arsenic pollutant (0.5, 0.7, 0.8, 1, 1.5 and 2 g/l) and concentration of palladium nanoparticles (0.1, 0.25, 0.5, 1, 2 and 4 g/l) was assessed. The specifications of the conducted experiments in each stage are shown in Table 1. In order to adjust the considered pH, NaOH and 0.1 molar HCL were used. In each stage of the experiment, a variable parameter and other constant parameters were considered so that an optimal condition of each parameter is obtained. Even for the preparation of samples initially, 5 ml of sample was taken and kept immovable for a period of 5 minutes so that the particles are settled. Then its supernatant was filtered three times via filter paper (0.45 microns pore diameter) with the help of a vacuum pump. Finally, the concentration assessment of this solution was carried out via furnace atomic absorption spectrometer (Conter AA700). Arsenic (III) adsorption percent via palladium nanoparticles has been demonstrated in Fig. 1. In this experiment the sampling was carried out in definite periods from the solution containing 0.5 g/l of Arsenic and 1 g/l palladium nanoparticles. Even, Fig. (2) shows the effect of different pH in definite period (5 minutes) on the adsorption of Arsenic (III). As observed in Fig. 1, initially, with time lapse the Arsenic level reduces with a higher rate and after 5 minutes this rate becomes approximately constant. This is in a manner that in a period of 5 minutes 89.8% and after the lapse of 30 minutes 92.1% of Arsenic is eliminated. The reason for this reduction rate can be considered as very high oxidation state of palladium nanoparticles and an as well reduction amount of contamination in the aqueous solution. Therefore, an optimal adsorption of Arsenic was obtained after the lapse of 5 minutes and it was used for conduction of next experiments. Even Martinson and Reddy in their study showed that adsorption rate of three and five valence Arsenic from the aqueous solution with the help of copper oxide nanoparticles was very high in the initial 30 minutes and after that reduced . Even as per Fig. 2 it can be stated that Arsenic adsorption percent from the aqueous solution with pH increase, reduces in a manner that this rate in pH 3 and 4 is 99.9% and at pH 5, 6, 7 and 8 is 91.2, 76.4, 75.9 and 60.3%, respectively. It may be due to low pH, H+ ions that exist in the environment compete with the metals to bind to the active site of adsorbent and so the metals with higher positively charge adsorbed simply . Thus, for the conduction of experiments to adsorption Arsenic, a suitable acidic pH accelerates the reaction. For this reason, in this study for conduction of more experiments pH=4 was used. Even Akin and associates in their studies demonstrated that with pH increase, the Arsenic adsorption percent from aqueous solutions reduces with the help of magnetic nanoparticles such that the maximum Arsenic adsorption was obtained at pH=2.5 . To assess the preliminary concentration of Arsenic contamination, the experiments were carried out in different Arsenic (III) concentrations and an amount of 1 g/l adsorbent and time and optimal pH determined in the two previous stages. The results of this stage of the experiment are depicted in Fig. 3. As demonstrated in Fig. 3 in the preliminary concentration 0.5 g/l, adsorption percent is 99.8% and later with an increase of concentration amount the adsorption percent also reduces. As with increase of three valence preliminary Arsenic concentration, the adsorption percent reduces from 99.8 to 53.4% wherein it could be due to effective reduction level of nanoparticles for the Arsenic adsorption. Rahmani and associates in their study to eliminate Arsenic via zero valence iron nanoparticles showed that with an increase of Arsenic preliminary concentration from 1 to 30 mg/l, the adsorption percent reduces from 100 to 88.3 percent, wherein these results are in concurrence with the present results. Adsorbent dose (palladium nanoparticles) is one of the important parameters in Arsenic (III) adsorption from the aqueous solution. For this reason, the experiments were carried out in values 0.1, 0.25, 0.5, 1, 2 and 4 g/l of nanoparticle and in the solution containing 0.5 g/l Arsenic (III). Fig. 4 also shows that with concentration increase of nanoparticles, the adsorption percent also increases till it reaches a saturation point. As in concentrations of 0.5 g and above, the existing Arsenic level in the aqueous solution was almost eliminated (99.9%) 100%. Therefore, it can be safely mentioned that initially with an increase of adsorbent dose the Arsenic adsorption percent also increased and later reaches a stable level. Goswami and associates in their study, for Adsorption of Arsenic in different concentrations via copper (II) oxide nanoparticles, showed that Arsenic adsorption percent increases with the increase of adsorbent amount and then reaches a constant quantum . In order to analyze absorbed isotherms, the obtained data were analyzed with the help of Langmuir and Freundlich adsorption isotherms. The linear equation of Langmuir and Freundlich adsorption isotherm was equivalent to the equations 1 and 2, respectively [15, 31]. Wherein KL is Langmuir constant, KF and n are Freundlich constants, Ce is a concentration of adsorbing substance in liquid phase after reaching an equilibrium state in mg/l and qe is the quantity of adsorbed substance in a unit mass of adsorbent in mg/g. Even the Pseudo first and second order kinetic equations were based on equations 3 and 4, respectively. Wherein in these equations, qe is equivalent to the amount of adsorbed salts in an equilibrium state (mg/g), qt is the amount of adsorbed salts at time t (mg/g), K1 and K2 are Pseudo first and second order kinetic equilibrium rate constants. In this study, the isothermal Langmuir and Freundlich models, as well as the Pseudo first and second order kinetic adsorption models, were used to determine the control mechanism of adsorbent processes. The constant coefficient and correlation coefficient of Langmuir and Freundlich adsorption isotherms and Pseudo second order kinetic is depicted in Tables 2 and 3. The Figs. 5 and 6 show the Langmuir and Freundlich adsorption isotherms and Fig. 7 shows the Pseudo second order kinetic adsorption. With the comparison of the correlation coefficient of both the isotherms, it can be concluded that Arsenic follows both the isotherm adsorption models. The correlation coefficient in Langmuir and Freundlich models were equivalent to 0.99 and 0.94, respectively. Even Koohpayezadeh and associates in their study for the Adsorption of Arsenic took the assistance of iron nanoparticles from the Langmuir and Freundlich model which shows that Arsenic abides both the models [24, 32]. Even the adsorption data better follows the Pseudo order two kinetic model in relation to the Pseudo order one kinetic (Fig. 7). Akin and associates in their study to eliminate arsenate with the help of iron nanoparticles showed that Arsenic adsorption follows the Pseudo order two equation and its R2 amount was equivalent to 0.99 . The results of present research clearly showed that palladium nanoparticles synthesized via green alga Chlorella Vulgaris in a short time period have a significant ability to eliminate Arsenic from the aqueous solution. This is in a manner that it introduces these particles as a suitable option for the Adsorption of Arsenic. In this study, an optimal condition for Adsorption of Arsenic from aqueous solution with the help of palladium nanoparticles was determined. The results demonstrated that in a short period of 5 minutes and at pH=4, 0.5 g of nanoparticle has the capability to eliminate 99.8% of Arsenic from the aqueous solution. Arsenic follows the two models Langmuir and Freundlich adsorption isotherm as well as Pseudo order two kinetic equation, in a manner that adsorption isotherms R2 were equivalent to 0.94 and for Pseudo second order equation equivalent to 0.999, respectively. This research paper is part of MSc thesis of Environmental Sciences department of the University of Birjand. The valuable collaboration of faculty authorities of Natural Resources and Environmental Sciences, University of Birjand to provide necessary facilities for conduction of this study is highly appreciated.